Fonio eo an anv a roer d'un doare ed eus kerentiad digitaria gounezet e kornôg Afrika. Ur spesad heñvel a-walc'h a vez gounezet en India. National Research Council (1996-02-14). 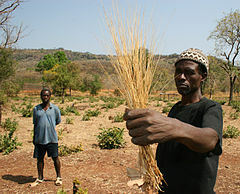 "Fonio (Acha)", Lost Crops of Africa: Volume I: Grains, Lost Crops of Africa. National Academies Press. ISBN 978-0-309-04990-0. Retrieved on 2008-07-18. Fonio: an African cereal. CIRAD. Kavet : January 10, 2006. Kemmoù diwezhañ degaset d'ar bajenn-mañ d'an 11 Mez 2014, da 02:12.